Be the first to share your favorite memory, photo or story of Agustin. This memorial page is dedicated for family, friends and future generations to celebrate the life of their loved one. Agustin R. Mercado entered this life on June 26, 1931 to parents Leopoldo Mercado Gonzalez and Josefina Reynoso Casillas. He was a hard worker and provider for his family. He was proud of his children and all their accomplishments. Agustin’s health started to decline slowly after the love of his life, Felipa passed in 2013. 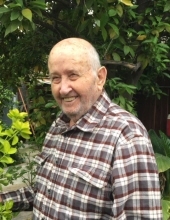 Agustin passed away peacefully at his home on January 24, 2019, surrounded by his loving family. Agustin is survived by his children; Bertha Mercado Singleton and husband David Singleton, Humberto Mercado and wife Jeanette Mercado, Hugo Mercado and wife Elena Mercado , Josephine Sanchez and husband Victor Sanchez, Elizabeth Mercado Zamora and husband Jose Zamora; grandchildren; Adrian, Alexandra, Cassie, Erica, David, Matthew, Brianna, Kristina, Lucas, Sarah, Diego, Sophia, Isaac; great- grandchildren; Cooper and a baby due in July; siblings, Ana Maria Jimenez, Catalina Mercado, Carmen Gutierrez, Alfonso Mercado. He is preceded in death by his wife, Felipa Mercado; parents, Leopoldo and Josefina Mercado; daughter, Josefina Mercado; brothers, Daniel Mercado, Leopoldo Mercado, Guadalupe Mercado; sisters, María Dolores Gutierrez, Maria Del Refugio Mercado. To send flowers or a remembrance gift to the family of Agustin R. Mercado, please visit our Tribute Store. "Email Address" would like to share the life celebration of Agustin R. Mercado. Click on the "link" to go to share a favorite memory or leave a condolence message for the family.